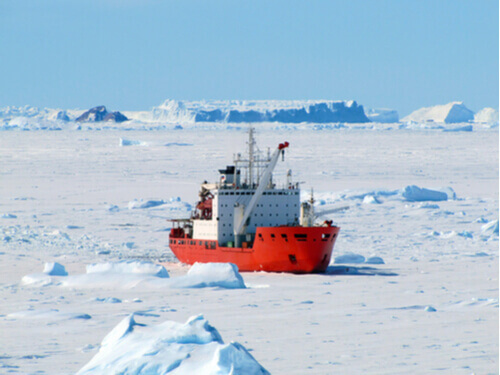 The options to get to the coldest corner of the earth are fairly limited to put it mildly. Trains, planes and automobiles are out, and unless you’re planning a summer-long expedition to the South Pole, most people chose to get there by boat. And what better way than to take in the stunning seascape and incredible ice cliffs from the comfort of a cruise ship. Cruises only take place during the summer months, from late October to early March, when the ice has melted enough for boats to navigate through. December and January are the warmer months, but temperatures rarely rise above freezing. The Argentinean city of Ushuaia – the most southerly city in the world – is the starting spot for most cruises. The ship will then head south towards the white continent past Cape Horn on the southern tip of Chile and through the stormy Drake Passage. Ahead are the Southern Shetland Isles and beyond that is northern tip of the Antarctic Peninsula. 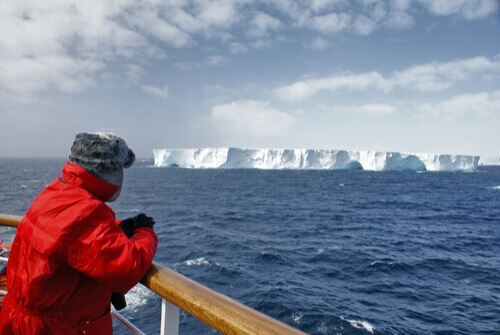 The waters around the Antarctic are protected (the Ross Sea is now the world’s largest protected marine area) meaning that the penguins, seals and whales that inhabit the area can hunt, play – and entertain visitors – undisturbed. Grey seals can be seen flopping around on the water’s edge, catching some rays and having a snooze. Or they might be found sliding elegantly through the sea on the hunt or perhaps just playing chase. Humpback whales can be seen leaping out of the water and throwing themselves down on their backs. 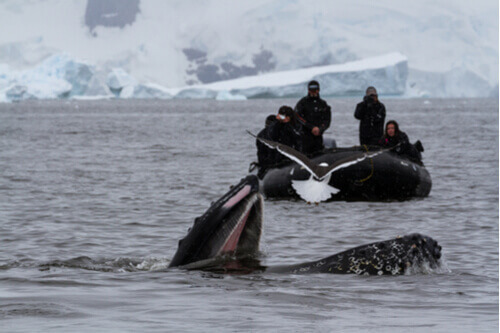 Recognisable by the huge flippers and travelling in pods of up to 20, humpbacks can often be seen feeding through the fertile feeding grounds of the Antarctic. Minke whales are also common to the area and are even known to approach boats. Smaller than the Humpback, the Minke whales can leap right out of the water and are found playing around the pack ice. Cruises will stop at a number of landing sites including many on the Southern Shetland Isles such as Deception Island, where a British Base lays derelict, or the incredibly photogenic Half Moon Island – home to chinstrap penguins and other local bird. 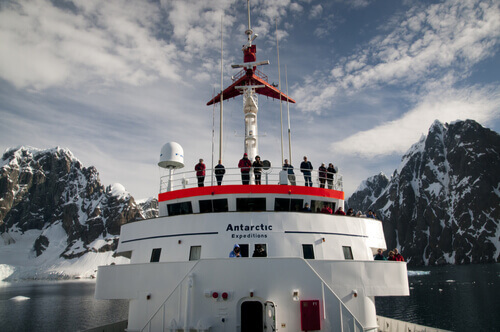 On the Antarctic Peninsula itself, stops at places including Paradise Bay where the crystal clear icy water reflects the blue icebergs and icy cliffs that roll into the water, or Peterman Island – the perfect spot for whale spotting. Many cruises will stop at the Antarctic Peninsula Penguin Colony but expect to see penguins galore throughout the trip. Note that in December the penguins will be sitting on their eggs before the baby chicks will be hatching in January and February when the weather is ever so slightly warmer. Most trips also include a visit on to the ice to see some of the huts that past explorers built on expeditions to the south pole. Many are still perfectly preserved over a hundred years after being built. Only 100 people are allowed on shore at any one time to limit the environmental impact, and all guests will be told where they can disembark and instructions on what to do on shore. However, don’t be surprised if you spot occasional brave souls stripping off and go for a chilly dip at some landing spots – so, if you’re feeling brave, don’t forget your swimsuit – not many people can claim to have swam in the Antarctic.